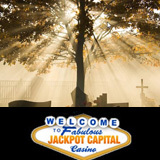 I heard some news today from Jackpot Capital Casino that's both happy and sad. One of their players, Lucille C., had an amazing run of good luck last week, winning $107,000 over two days. Sadly, this was just two days after her beloved nephew had passed away. She believes her nephew, who died just two days before her winning streak, was her good luck charm so she’ll use her winnings to give him a nice send off. Retired and living with her sister and family in a quiet neighbourhood, Lucille C. was playing her favourite online casino games to take her mind off her grief. Lucille made a $60 deposit and then won 7 slots jackpots over a two day period. It started with a $52K win on the Achilles slot machine game. Within hours she won $22K playing the new Builder Beaver slots game. A $3K win on Caesar’s Empire and then $7K on Coat of Arms were smaller but just as exciting wins. Her good luck continued the next day when she won $29K on the Prince of Sherwood. Add a little $1700 win on Count Spectacular that evening and her total for the two days was over $107,000. Known around the world for its easy deposits and withdrawals, Jackpot Capital has more than 300 games from Real Time Gaming (RTG). Naturally games like Jackpot Piñatas and Aztec’s Millions with their million dollar progressive jackpots are among the most popular. Players are encouraged to congratulate Lucille on her win, and offer their condolences, on the casino’s Facebook page.